Dollhouse Miniatures by Felma J.: Can You Believe It? We have A February Winner Already! Can You Believe It? We have A February Winner Already! tutorial in these 3 issues! Can you believe it my dear friends? We have a February winner and March is tomorrow. Where did the time go? Have I squandered it? Hope everyone is all well and finished with this Season's cold and flu. My heart and prayers go out to those of you who are having a difficult time with the unusual weather we are experiencing in many parts of the world. Yes, there are other issues much worse than the weather, but discussing it would surely produce another Blog. No time for another blog because I need to finish my book I've been working on for the last 30 something years. Speaking of books, there is a possibly that some of my brand new designed Wedding Gowns along with accessories will be shown in the June 2014 issue of American Miniaturist Magazine. Jared and Mark J (you know who they are) have been busy creating new designs and it will be a real treasure to showcase them in American Miniaturist Magazine. And if you are not already a subscriber, contact American Miniaturist Magazine and subscribe in time for the June issue. Drum Roll Please for the above winning comment pulled from my lucky hat by grandson. Irina has an interesting and lovely blog at NarinaNapertaa. Please give her a Congratulations Irina! It was your lucky day! There will be at least 3 give aways for March. 1. 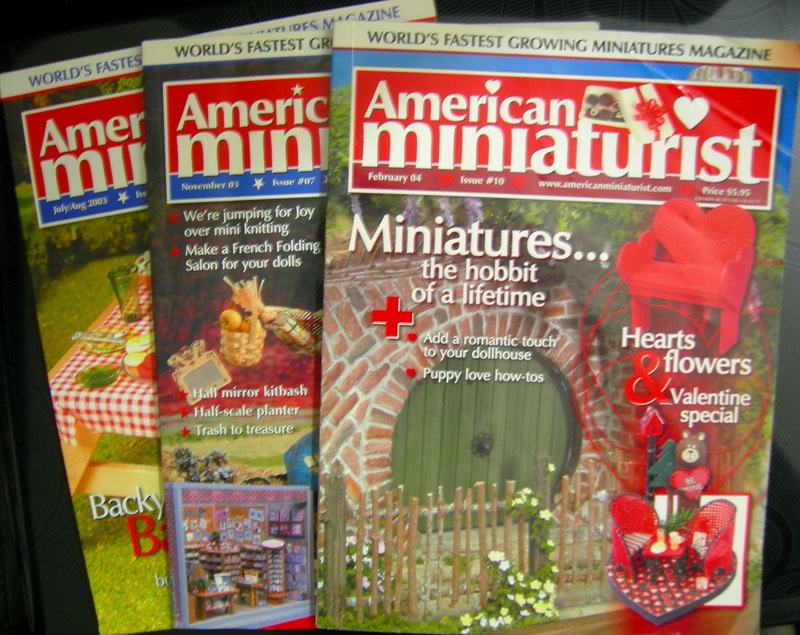 Three American Miniaturist Magazines: Issues 5, 7 and 10. These three were chosen because they are packed with great Artists from some of the first issues and have lots of great articles for you to read and pictures to look at along with tutorials that are easy and fun! If you are featured in one of these magazines, please leave a comment and let us know if you have a blog for us to read. 2. A porcelain mannequin that is not dressed so that you can dress it your way and share it with us on your blog. 3. Another mannequin with a different figure! For those of you following my blog or going to start following before the deadline, all you have to do for a chance to win one of these prizes is leave an inspirational comment on this post only by the deadline of Midnight March 18, 2014 Pacific Daylight Time. Winners will be announced the following week. Now the best part of this post. Thank you to all of my followers. I am so happy that you leave inspirational comments. Your comments are the source of my happiness with this blog and I feel honored to offer giveaways to you. A warm Thank You to my new followers and Shabbiest I am so happy that you found me. I'll be happy to put some mini girl dresses and suits on eBay for you to look at or purchase. Thanks for asking. This is my 10th Anniversary selling minis on eBay! Please take a look. My name is anyminimore and sometimes I list some really pretty things for auction. I don't ship worldwide, but something I am looking forward to doing in the near future. Congratulations Irina! Thank you Felma for the opportunity to win your wonderful giveaway! Felma, you're very generous. I participate in your March giveaway and I put the link on my blog. Onnittelut Irinalle! Congratulations for Irina! Muchas felicidades por tu buena salud y por tu nueva publicación. Felicidades a la afortunada y muchas gracias por darnos la ocacion de poder participar en tus sorteos. Congrats to Irina a lucky win, and a very war congratulations on your publication! Enhorabuena a la ganadora Irina. Ooh.. Can't tell you how happy I'm right now! Sent you e-mail.. Hope you got it..
And last but not least a big congratulations to Irina for winning your generous giveaway! Oh my... Same head all year round..
Enhorabuena por tus publicaciones y por ese libro tan especial que estás haciendo. Cuenta conmigo para del siguiente sorteo y sigue disfrutando de la vida. eres muy generosa Felma, suerte en tus nuevos proyectos! congratulations to the Winner and to you Felma I hope they add your wedding dresses to magazine that would be awesome. Please count me in your March giveaway, the link is already on my blog's sidebar. Congrats Felma on being bublished! Please count me in into your generous Giveaway! I already have the link about your giveaway in my blog. Congratulations to Irina for her gorgeous prize! Congratulations to you Felma for being published. More and more people will get to know your beautiful art. Your new giveaway is very generous.